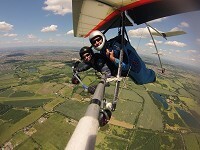 A uniqie opportunity to fly with the same team and on the same Hang Glider as Blue Peter presenter, Matt Baker. Your flight, up to 3000 feet, is one you will remember forever. 1 hours, with 25 minutes in the air. 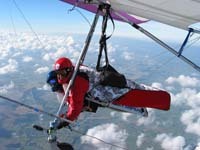 Combine an unforgettable tandem flight up to 3000ft with the chance to get involved, help out on the ground and really get a feel for what hang gliding is all about. 4 hours, with 25 minutes in the air. 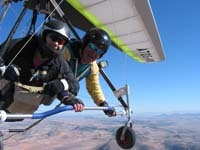 It's the tandem Hang Gliding experience of a lifetime! Towed behind a microlight to 3,000 feet you can fly the Hang Glider or just enjoy spectacular views over the beautiful Peak District. 2 hours, with 45 minutes in the air. 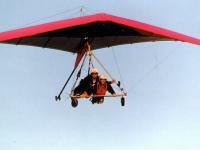 It's the tandem Hang Gliding experience of a lifetime! Towed behind a microlight to 3,000 feet you can fly the hang glider or just enjoy spectacular views over Derbyshire's beautiful Peak District. A unique opportunity to fly with the same instructor who taught Blue Peter presenter, Matt Baker. Your flight, up to 3000 feet, is one you will remember forever.